Phoenix, AZ -- Arizona is infamous for not supporting the Martin Luther King Jr. holiday. It is also a state where former Arizona Governor Evan Mecham publicly defended a book that used the derogatory term "pickaninny" to describe African-American babies and children. It is a state where the economic restrictionist Governor Jan Brewer signed a draconian anti-immigrant law via SB 1070 that cost Arizona millions of dollars when believers in human rights boycotted Arizona. Arizona is a state that continued to dehumanize babies when Republican lawmakers referred to brown babies as "anchor babies". Arizona is a state where a Republican lawmaker submitted an anti-gay bill via SB 1062. And now we have a new Rep.-elect Jay Lawrence who essentially fits in with the aforementioned bigots in light of singling out DREAM Act students and their drivers licenses in our state even though a federal judge has pointed out racial profiling concerns in our State of Arizona with regard to Sheriff Joe Arpaio and his department. Lawrence's bill would enable racial profiling and undo the progress the Courts have made with regard to law enforcement and immigration. The Phoenix Police Department and Phoenix Law Enforcement Association are already under fire with regard to an unarmed black man via Rumain Brisbon getting shot to death by an Anglo police officer while delivering food to his family and we cannot support Arizona bills that enable racial profiling any longer. My Jewish sensibility tells me we've seen the likes of Jay Lawrence before, wearing a Nazi uniform. It is unconscionable, in this day and age, to differentiate an Arizona Driver's License with "Non-Citizen". How is this any different than the Nazis requiring Jewish Germans to identify themselves with yellow arm bands while making passage in public? Such profiling is insulting and divisive. Jay Lawrence wants to continue the "Us vs. Them" attitude in Arizona, an attitude that has colored legislation and culture, an attitude that has been officially struck down in the 9th Circuit Court of Appeals and cost our state $1.5 Million dollars. Such an attitude brought down Nazi Germany as the world fought against similar mindless prejudice. Lawrence is the new face of Conservative Arizona, bound to continue contributing senseless and hateful ideas that most will see as reinforcing Arizona's reputation as the laughing stock of the nation. 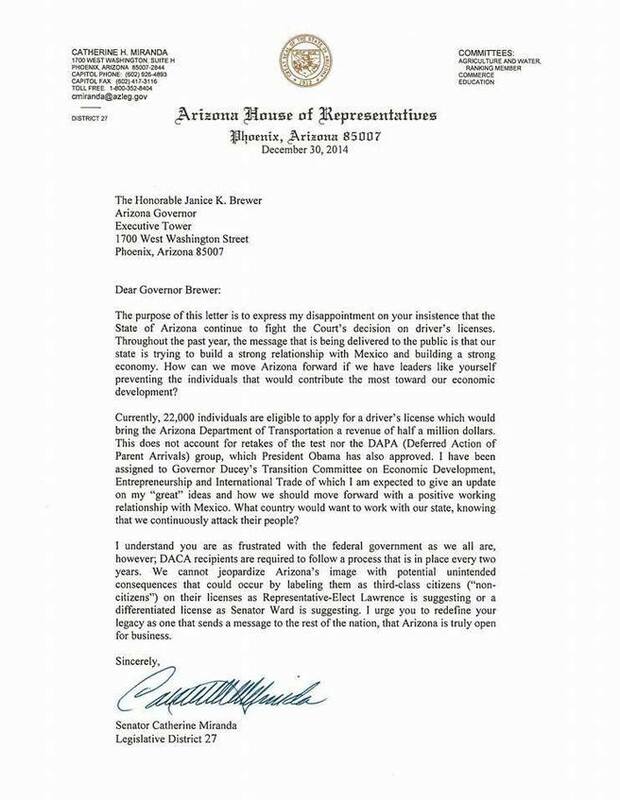 We also applaud Sen. Miranda for her rapid letter to Governor Jan Brewer in light of this humanitarian concern.